The funeral for Graham Elmes will take place at Lady St. Mary Church, Wareham on Monday 8th January at 12:30pm. There will be open ringing from 11:30am to celebrate the life of Graham; all are welcome. After the service a peal will be rung by Graham’s peal ringing friends. The next Minor Practice at Canford Magna will be on Wednesday 9th August at 7.30 pm. This is for ringers who can ring Plain Bob Minor and would like to move on. Helpers/standers by are most welcome. There will be another practice at Canford Magna on Wednesday 14th June for those who want to improve their ringing of minor methods. We will concentrate on Double Court and revisit Single Oxford, St Clement’s and Little Bob, depending on who turns up. I’m afraid that I’m going to have to cancel the practice at Kingston tonight, to all who were planning to come am so sorry for being last minute. There will be a practice held instead next week and all are very much welcome to come. Again, so sorry for last minute notice. The next one of these will be this Monday February 6th from 2pm to 3.30pm.. The practice will be for those wishing to move on to methods beyond Bob Minor up to 6 and 8 bell surprise. Other practices will be on May 8th (second Monday), August 7th and November 6th. Please let me know if you intend to come as it would be useful to have an idea of numbers beforehand. Although we managed without ‘helpers’ last time, we would really appreciate experienced ringers to help us – especially with calling touches. Tim Rose (SDGR) has put together a helpful set of notes on this topic on his website. They have been road tested and found to be very useful! As some of you may know, I have been working with Mike Pitman recently to try and formulate a plan to get the practices and quarter peal nights up and running at Kingston again. They are such a beautiful ring of bells, and being a Kingston ringer myself for years I hate to see them not being rung as much as they should and going to waste. As I have finally finished university and returned to the area I now have time to dedicate myself to re-establishing a regular practice night. However, I need as much support from everyone as I can and am asking for your help. Mike and I have come up with a concept of having two practice nights and two quarters a month on a friday so that the bells are rung every week, and we hope that it at least one night a month may appeal to all ringers of any standard, so that people don’t feel pressurised to dedicate themselves every single week. The below is the monthly structure which I am trying to introduce, and I would love to hear what you guys think, advice etc as have never done anything like this before. of becoming a supportive teaching tower. We are aiming to create a monthly structure that caters for ringers of all abilities; whether you are a called change ringer or a surprise ringer we hope to provide something for everyone. Any ringer of any ability who is interested in getting practice at ten bell ringing is more than welcome. Ringing will range from Rounds and Called Changes to Plain Caters and Royal, as well as any six to eight bell ringing if its requested. Whatever you’re learning, come along! Any more advanced ringers who can help out will also be very much appreciated too. For ringers who want to challenge themselves learning Surprise Royal or just want to keep the cobwebs off. We will be practicing the Standard Eight Surprise Royal methods (and others as time goes on) with a special method to focus on every week. This course was hosted Salisbury Guild and two ringers from Ringwood (C&S District) were among the trainees. Alan has included the feedback and overall ratings that the trainees gave at the end of the day. ART MODULE 1 COURSE, LYTCHETT MATRAVERS, DORSET, 19 NOVEMBER. The purpose of the course was to introduce new and would be teachers to the skills and techniques necessary to take a novice ringer from their first lesson to having good bell control. The 1 day course is a combination of both practical and theory sessions and is based upon the Association of Ringing Teachers ‘Learning the Ropes’ scheme. Despite having no heating in the church (ground floor ring) due to contractors not completing the new system in time the participants did not appear to be unduly affected during the practical sessions by the reduced temperature and all entered into the spirit of the occasion with a great deal of enthusiasm. The hot, home made soup at lunchtime probably kept everyone motivated for the afternoon sessions. Fortunately the tutor room was warm (and cosy) which also encouraged participants to exchange ideas and discuss the points raised by Pip during the theory sessions. The group was made up of 8 new teachers and 2 mentors, mainly from the SDG plus 2 from the W&P Guild. We were joined by a shadowing tutor, Geoff Horritt, so together with the course organiser, Alan Bentley, Pip was able to pair 50% of the new teachers with a mentor for the practical sessions. Geoff was also on hand to offer valuable anecdotes and opinions in addition to Pip’s during the course of discussions. 1. Becoming a good teacher – Exc 6, Good 3, Ave 1. 2. Teaching a skilled activity – Exc 6, Good 3, Ave 1. 3. Solving common handling problems – Exc 6, Good 3, Ave 1. Length of session – About right 9. 1. Basic components – Exc 8, Good 1, Ave 1. 2. Joining both strokes together – Exc 8, Good 1. 3. Teaching ringing up/down in easy stages – Exc 8, Good 1. 4. Solving common handling problems – Exc 6, Good 3. Length of session – About right 8, too long 1. Overall satisfaction – 10 (3), 9 (4), 8 (1). This would be a good course for experienced ringers whether or not they want to become an accredited teacher. Learning to teach is a great way to improve one’s skills and cure one’s bad habits. Some reassurance that how I’m teaching so far is going in the right direction and some extremely helpful exercises and techniques. When couples are doing a practical suggest you could say when to change over, I had a couple of times when my teacher took a long time explaining what to do then I did it then there wasn’t time for me to be the teacher. I have not taught before so I’m not sure how confident I would be in solving problems However, this course has given me confidence in beginning with a learner. I really enjoyed this session. I would perhaps have liked more time on ‘things that can go wrong’ which for a very first time teacher I worry about – maybe unnecessarily. I would have liked to be involved more with hands on mistakes by the learners. Otherwise a very helpful and well run course. Please try not to make it too bureaucratic. A long day but don’t think it could have been split. This month’s Minor Practice at Canford Magna is on Wednesday 9th from 7.30pm to 9pm. We will consolidate St Clements then move to Little Bob Minor. If you interested in giving this a go or in helping, please let me know. On Saturday 19th November 4.15-5.45pm there will be another practice for younger ringers at Bryanston ringing centre (the church in the grounds of Bryanston school, near Blandford). There will be the opportunity to ring on both 6 and 8 bells, so please come along and tell us what you would like to practise! Please email me (form below) if you would like to come – or just turn up on the day. If you need directions to the church, please email me. If you need a lift, again please let me know. I am also looking for some more experienced ringers (of any age) to come along and help. We will probably be ringing Plain Bob, Grandsire and Stedman. If you are able to help out, please email me so that I know we will have enough people. Several of our regular helpers are unavailable on this day, so I would be very grateful for your support. Paul Tyson and I would like to announce that a new Monthly Minor Practice will begin on Wednesday 12th October at Canford Magna church – 7.30pm – 9.00pm. The idea is to help ringers progress to more complex minor and, eventually, Surprise Minor methods, with the help of experienced ringers to support them – but it all depends on the number of people who turn up – in particular helpers. The minimum ability is that you can ring touches to Plain Bob Minor. The first method will be St Clement’s Bob Minor. If you want to attend this session and learn to ring this method please ensure you’ve looked at the line and have a rough idea about the touches. Course fee: £20, plus £5 for lunch & refreshments. the benefits of intensive teaching. Anyone over 16 years of age can participate. Tours, Refreshments, Play Areas, Vroom Room! Please complete the attached form and return to Robert Wellen for each young person attending either by post to Sallie Ingram or by e-mail via wpbells@gmail.com. I am setting Wednesday 17 August as the deadline for confirmation of attendees. There will be no charge for the day but a voluntary donation (suggested minimum £10) for each young ringer and adult would be most welcome (to go towards donations to towers, catering, hall, minibus hire (if applicable) and entrance to the Haynes Motor Museum). Time to congratulate the neighbours – click through to read the full article on the SDGR website! 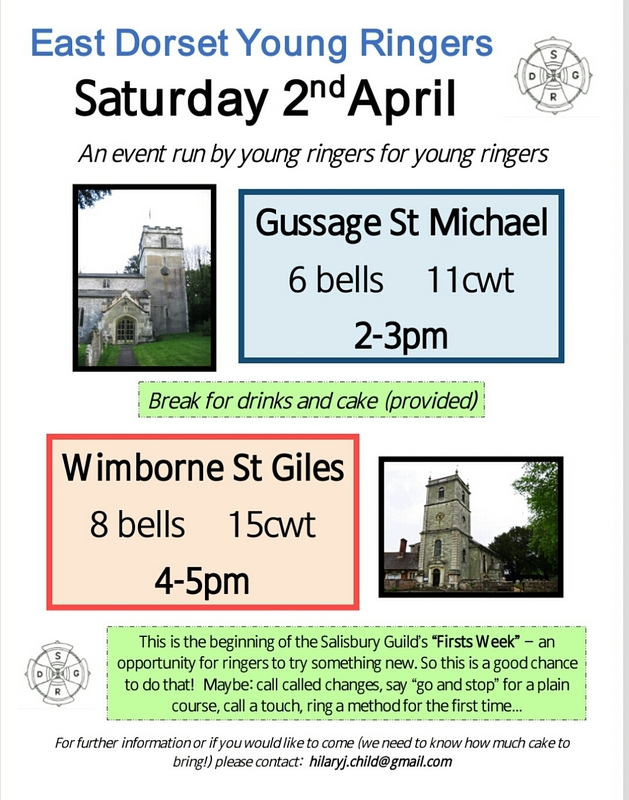 Reminder about the Young Ringers’ event this coming Saturday 2nd April. Children, teenagers and young people in their twenties are all very welcome. Parents/taxi drivers welcome too! We hope to see as many young ringers there as possible. If anyone needs help with transport, please get in touch. At the East Dorset Branch AGM in January I agreed to organise a few events this year for the younger ringers in our area. The first event is going to be on Saturday 2nd April and I would like to encourage young ringers to come! Please find a poster attached with all the information. Our definition of “young” is quite wide – children, teenagers and young people in their twenties are all very welcome. There will be a wide variety of ringing, from rounds and call changes upwards and there will be plenty of people who can help less experienced ringers if necessary. It would be helpful, but not essential, to know in advance who is planning on coming. Parents who are ringers are welcome to come along and have a ring, but my intention is for the young people to do as much as they can themselves and for parents just to fill in and stand behind as required.